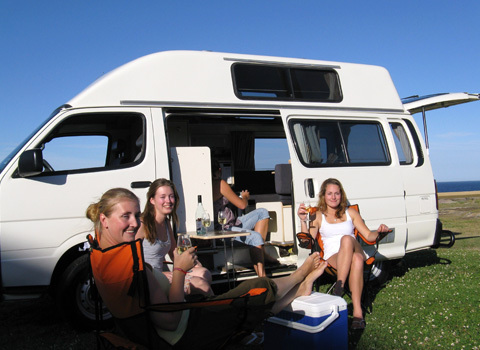 Travelwheels campervans sales in Australia have some great used Toyota Hiace Campervans for sale in Brisbane at the moment. Travelwheels campervan hire is selling off a number of our ex-hire campervans for sale and this is a chance to pick up a bargain! These used toyota hiace campervans for sale are all fully serviced and ready to go! They have been all professionally cleaned and the stickers removed so it’s ready to go for you! The interior of our 3 Person Toyota Hiace campervan is perfect for those planning a big trip around Australia. It has a great kitchen area and has worktops to prepare food, sink and two burner gas stove, microwave, fridge and freezer, water tank, air conditioning, two batteries, and plenty of storage space as well! The great dining area easily converts to a big double bed and there is even a single bed in the roof as well! This ex-hire Toyota used campervan for sale from Travelwheels is perfect for getting out there and exploring Australia! It will give you all the comfort of home while still having the freedom that buying a used Toyota hiace campervan will give you!